As you might remember, my relationship to Benton products is not the best. I tried they Benton Snail Bee Steam Cream and the Snail Bee High Content Skin, but my skin didn’t seem to like either of the two products. There are many different opinions towards Benton skincare products and there are people in love with it and other people don’t like it. 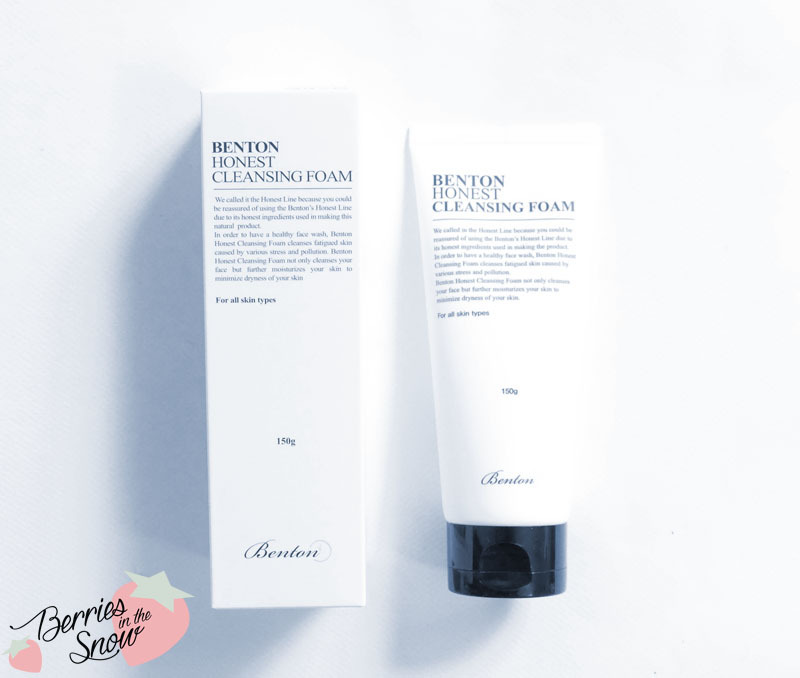 Nevertheless, when I heard about the new Benton Honest Cleansing Foam I was curious about it, and somehow I was lucky enough to receive the reviewing opportunity for this product by Jolse. The Korean skincare brand Benton did unleash a noticable raving amongst lots of bloggers. Especially the high quality of the ingredients, without any additional fragnances or other fillers did impress most people. Also, the key ingredient in their famous Benton Snail Bee skincare line being snail secretion filtrate in first place and adding bee venom on top made it widely appalling for skincare junkies. Apart from all the raving people there were also incidents of people breaking out from the Benton Snail Bee line, and I had also a similar experience. As soon as I stopped using it my skin recovered. Nevertheless, I’m giving the Benton skincare a new chance by trying their newest addition to their skincare line, the Honest Cleansing Foam. This cleanser promises not only to cleanse your skin, but also deliver the necessary moisture to the skin. This is a high promise, since most foaming cleansers tend to be drying. 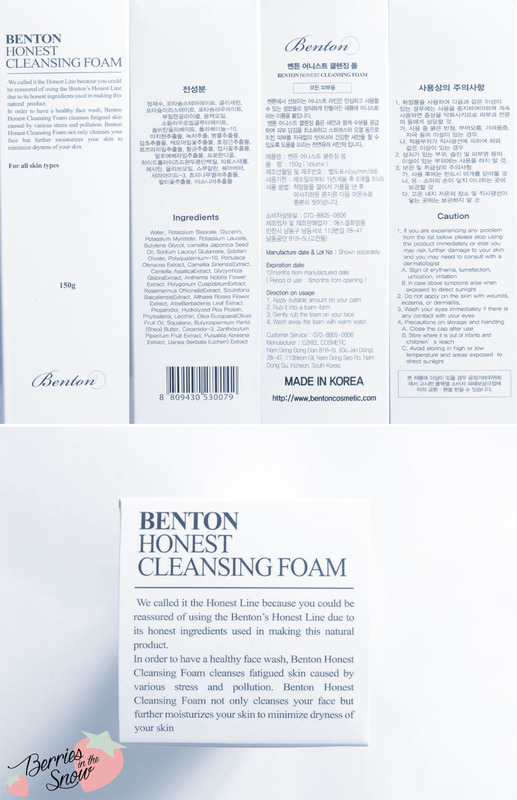 The cardboard box of Benton’s Honest Cleansing Foam consists mainly of description either in Korean or English. It describes how to use the product and the full ingredient list. You can check the ingredients on COSDNA, too, and they are safe to use. The ingredients are mainly plant extract and oils. Inside the cardboard box you will find a tube containing the foam cleanser. Similar to the cardboard box the packaging of the tube is very simple. The white plastic tube comes with a simple black cap. The tube was sealed when it arrived, so you can be sure that it was unopened before. The backside of the tube shows some Korean and English descriptions again. The Benton Honest Cleansing Foam has a shelf life of 6 months after opening and contains 150 g volume. The tube (and the cardboardbox) also show the web address of the official Benton page. 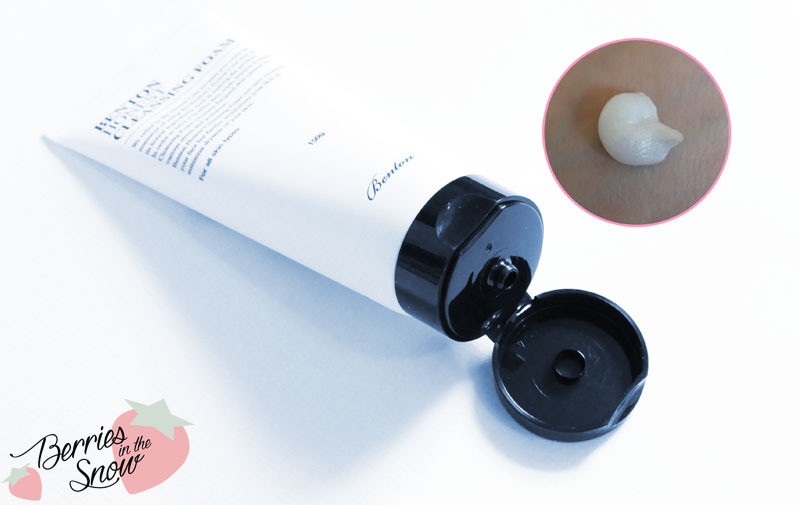 The foam cleanser itself has a white creamy texture with a glossy appearance. If foams up nicely with a foaming net, but the foam is not as dense as for the Rosemine Floral Remedy Cleanser. The pH is unfortunately between 7-8, so people using more acid cleansers will have to skin this one. It has a light soapy scent, which gives the feeling of being clean and fresh. The Benton Honest Cleansing Foam has an average perfomance when it comes to makeup. As you can see below it has problems with waterproof makeup. It will serve nicely if you are using a two step cleansing routine with an oil cleanser at first. I would not rely on the Benton Honest Cleansing Foam for washing off makeup. Apart from this, it leaves the skin in a nice condition, and here is my most surprising verdict from this cleanser: I thought the Rosemine Floral Remedy Cleanser was gentle to my skin, but this feels amazing afterwards! It feels like having cleansed with an oil cleanser. It is not stripping at all (even though the pH is higher). Speaking for dry skinned people, this foam cleanser was really the first one (despite the Sum 37 Miracle Rose Cleansing Stick– if you would count it as foam cleanser) that did moisturize my skin after washing it! Do I recommend the Benton Honest Cleansing Foam? So, if you are looking for low pH cleansers this one is not for you. If you are looking for a one step cleansing product I wouldn’t recommend this cleanser either. But if you are using a two step cleansing routine and you don’t want to remove special makeup from your skin and your previous foam cleanser have been too drying I can recommend this one to you. I tried it or almost three weeks now and I didn’t have any negative reactions towards this product either, which really makes me happy considering my previous experience with Benton products. You can get this foam cleanser from Jolse and it is discounted to 11.88 US$ at the moment. Just as a short reminder: All products mentioned and reviewed on this blog are of my personal opinions. This product here was sent to me for reviewing purpose by www.jolse.com, which doesn’t influence me in providing my honest opinion on the products. my skin loves benton snail essence and steam cream. they are my holy grail..